Next door to the Moab Brewery!!! ~Yes we rent bikes, you can check them out on our website if you click on the bike rentals link from any page on the site, or you can give us a call and get personal input on a bike you are interested in. Please note: you must be 18 years or older to rent a bike. Under 18 requires parental or guardian consent. Is a helmet included with the rental? ~Yes, if you rent a bike the helmet is included. ~Yes, if you just need a helmet and not a bike, we can rent out a helmet: $5 for a regular helmet and $10 for a full face helmet per day. Do you rent bicycle carrier racks for cars? ~Yes, we do rent bike racks. If you rent a bike a trunk rack (can hold 2 bikes) will be $5 per day and a hitch rack (can hold 4 bikes) will be $10 per day. If you do not rent a bike the trunk rack will be $10 per day and a hitch rack will be $15 per day. Is a repair kit included with a bike rental? ~Yes, if you rent a bike from us a kit that includes: a spare tube, a patch kit, two tire levers, and a pump, will come with the rental bike. Do you rent body armor? ~Yes we rent out elbow pads and knee pads for $5 per day with a bike rental and $10 per day without a bike rental. Is insurance available for purchase on my rental? ~Yes we do have bicycle insurance for customers that would like it. It is optional, but recommended. What is a “full day” rental or “half day” rental? Please note: Summer rentals (Mid-June to 8/31) are different due to high temperatures during the day. Rental pickup is at 5pm and return is the following day at 1pm. This allows you to take advantage of the cooler evening hours and morning hours. Does Chile Pepper or another company provide shuttle services to the trailheads? ~Yes, we work directly with Coyote Shuttle. Coyote Shuttle picks up at our shop. There is a fee for the shuttle and a reservation for the shuttle is recommended. Can you recommend a trail that will best suit my/our ability level? ~Yes we can. There are plenty of trails to choose from that range from beginner, to intermediate, to advanced riding skills that we can recommend to you. Do you have a coffee bar? ~Yes we do, we serve locally roasted espresso from Fresh Moab Coffee (FMC)! Do I need to have a hydration pack to ride with? Yes you will need one. We recommend riders carry at least 2 liters of water and 3 liters for longer rides. 1) Make sure to have our address correct on the box. 2) Be sure to put CUSTOMER and then your name in the return address area. 3) If you would like for us to build the bike, write in big letters on the box somewhere BUILD. If you would not like us to build your bike please write DO NOT BUILD in big letters somewhere on the box. 4) We will store the bike for up to 3 days at no charge, additional days are $5 fee per day for storage. 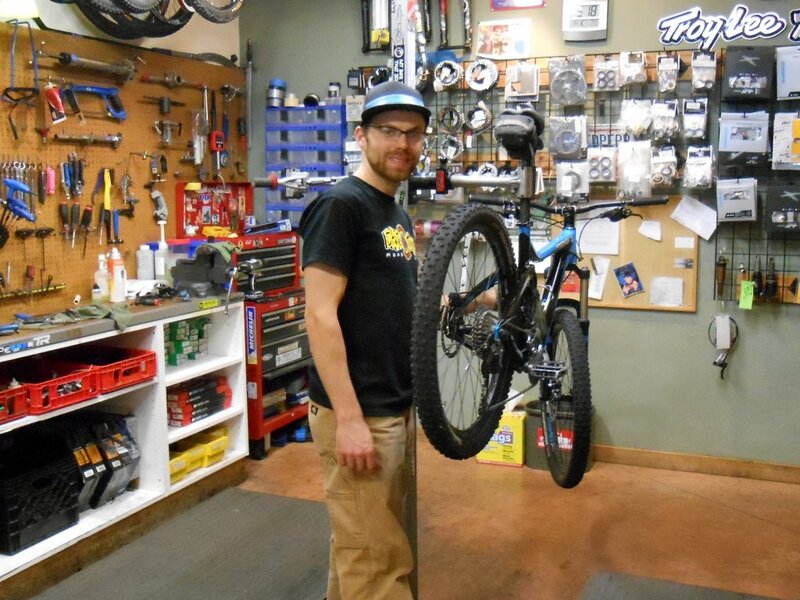 We can ship bikes for you! We can take your bike apart and box it up for you, or you can bring in the bike already boxed up, and we will ship it out for you. 2) Sometimes the price that it cost for you to ship the bike to us will be different from the price that it will cost to send it back. 3) Requesting insurance is always recommended. 4) We do have bike boxes for sale if you need one – they are $20. requirements. It will cost a great deal more if you do use an oversized box. Do we do fork and rear shock overhauls? Yes!! We do fork and rear shock overhauls! !